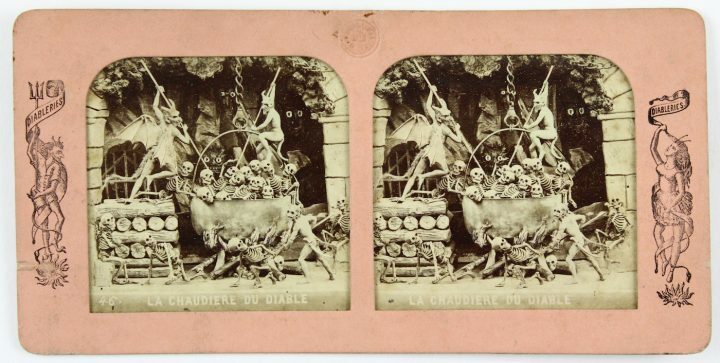 As one group of 19th-century French artists envisioned it, hell was no desolate destination for the damned. 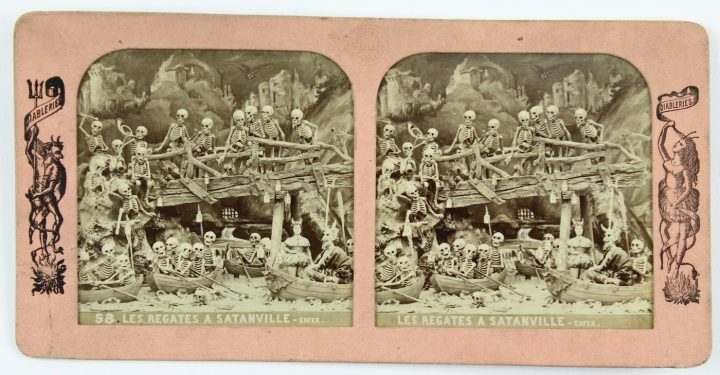 Rather, it hosted boating races, witnessed parties with a “live” band, and even boasted a lavish boudoir for one “Madame Satan.” Such are the scenes they depicted in their series of humorous stereoviews produced in the 1860s that capture a vibrant underworld of devils, skeletons, and satyrs, each carefully hand-colored so the frozen figures came alive with glowing red eyes. 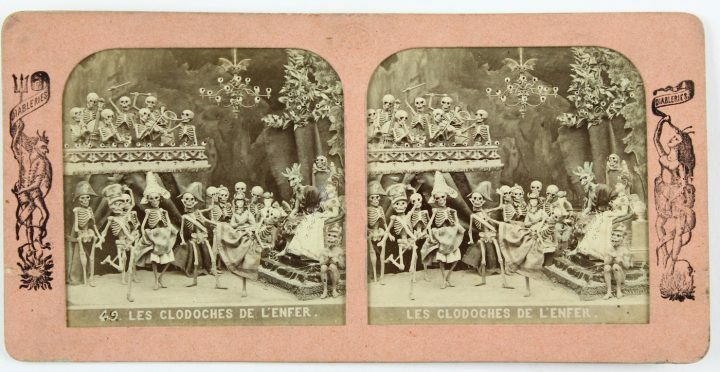 Titled Diableries, the series was published primarily by Frenchmen François Benjamin Lamiche and Adolphe Block, as told in a publication, also called Diableries, that chronicles the works’ history. 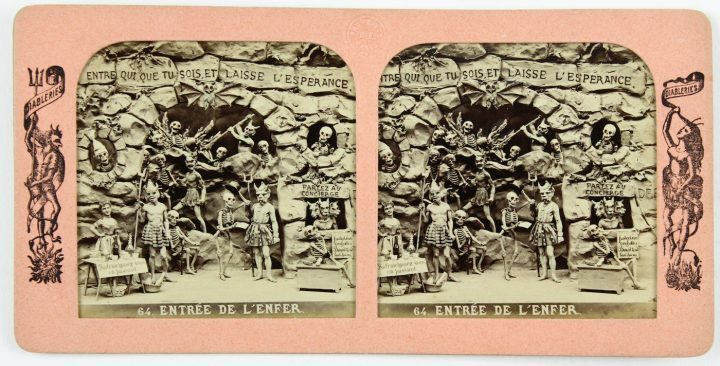 Unlike most stereoviews, these images married sculpture and photography: sculptors (unidentified on the images) would craft small dioramas from clay that would then be photographed and printed on albumen paper. 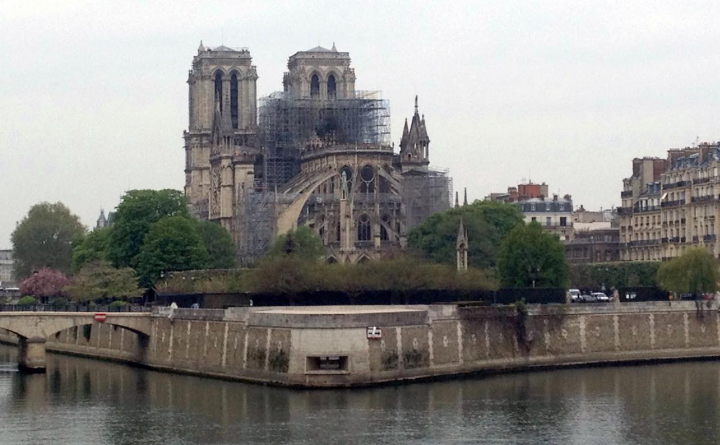 The artists then applied watercolors to the fragile prints, added a layer of backing tissue, and inserted the prints into cut-out windows of two cardboard frames. 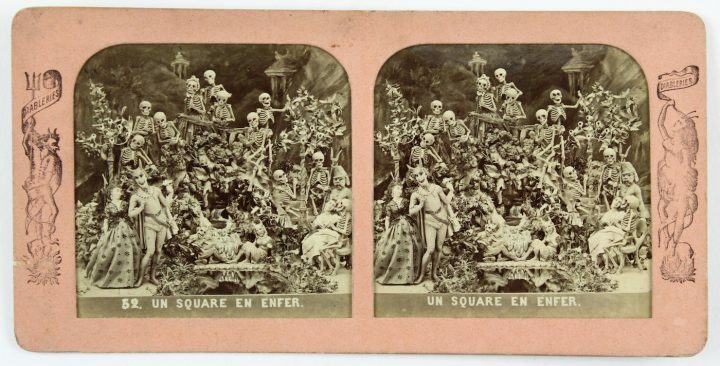 The tissue stereocards, therefore, offer two views: when seen with light hitting only their front sides, their images seem black-and-white; but when illuminated from the back, colors appear to render hell in vivid visions. 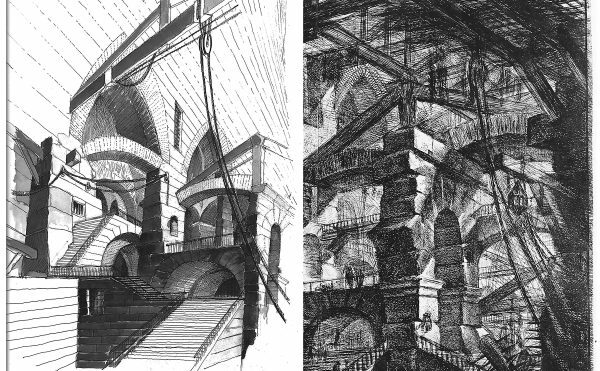 The artists would also pin prick sections of the images and apply color to these markings so light passing through the holes would highlight details on costumes or settings, even making them sparkle slightly. 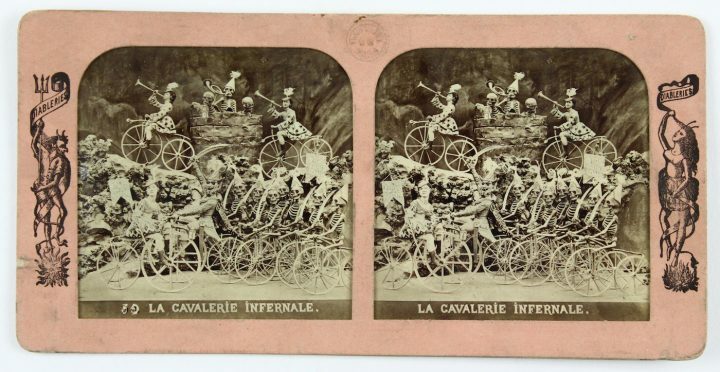 A full set had dozens of individually captioned scenes, guaranteed to provide viewers with a unique form of entertainment in 3D when placed on a stereoviewer. 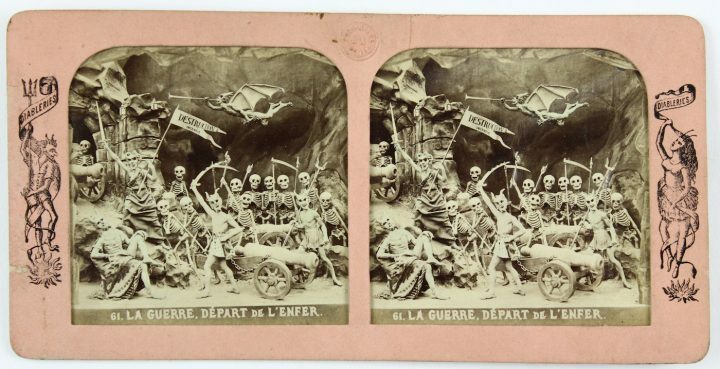 Stereoviews were highly popular in the 19th century, but the Diableries would have certainly stuck out from many other sets: collections of travel photos, artworks, and religious pageantry have quite a different tone from these scenes of skeletons riding bicycles, playing instruments in a bony band, and dancing in flouncy dresses. 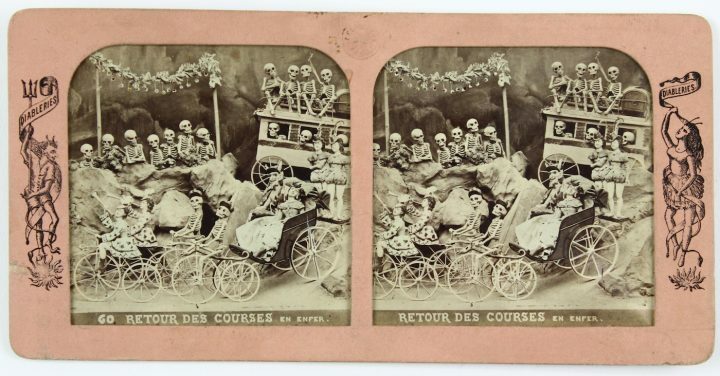 Swann Auction Galleries is selling 11 cards (est. 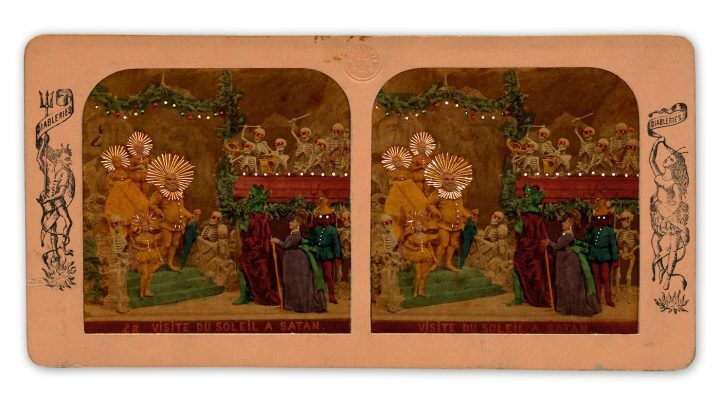 $600–900) as part of its forthcoming sale “Icons & images: Photographs & Photobooks.” A couple of these scenes show hell as you may expect it: in one, winged demons poke weapons at skeletons crowded in a massive cauldron while wide-eyed monsters gawk from dark corners; another shows the entrance to hell, governed by a three-headed beast and monsters holding pitchforks. 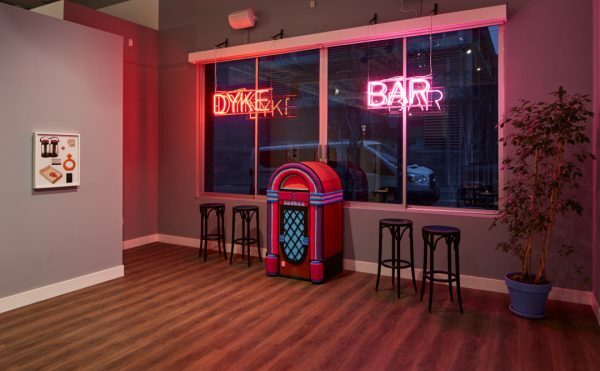 Humor, however, is the clear, reigning mood in these Diableries: a sign above the beast in that latter image reads, “Speak to the concierge”; there’s also a skeleton lifting his top hat to a guard while a woman in the corner offers water for passersby to refresh themselves. 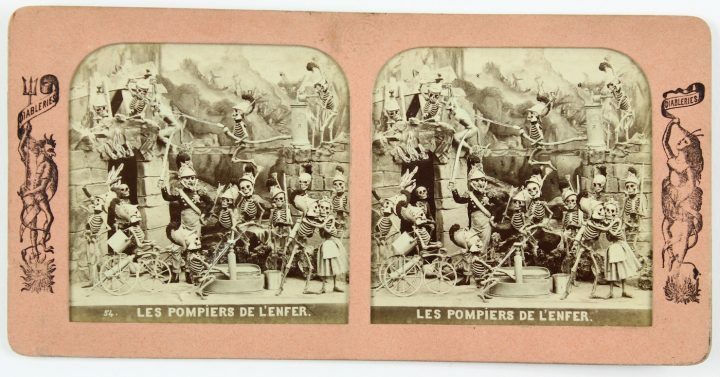 Hell, here, is clearly no dry, fiery realm: another card features skeletal firefighters pumping water and riding a firehose; then there’s the crowded scene of a regatta, where spectators watch the racing rowboats from a rickety bridge. 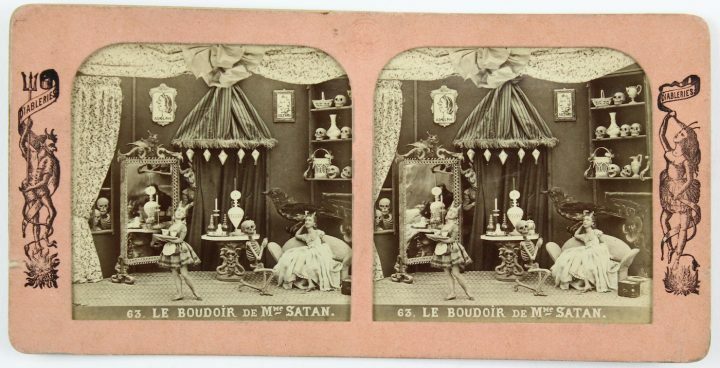 Meanwhile, in Madame Satan’s boudoir, a female figure serves the proprietress and a suitor tea. 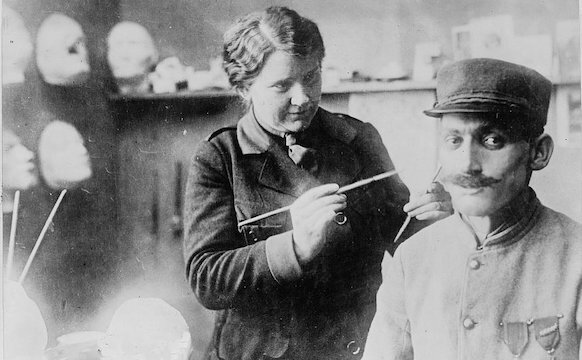 These characters are clearly enjoying themselves as they would be in the world of the living, albeit as fleshless faces. 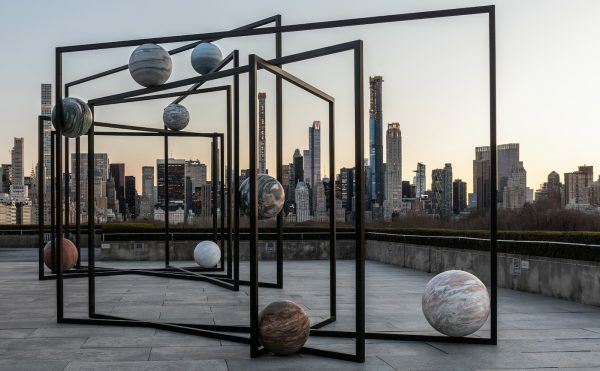 As viewers, we have plenty to revel in from these delightful narratives and detailed tableaux, and it’s all too easy to forget the sly critique underlying such exquisite craft. 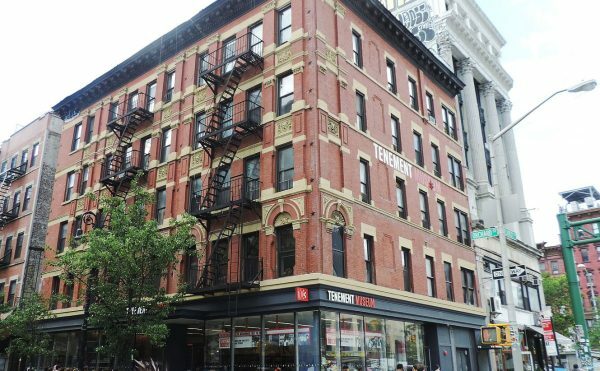 The auction Icons & images: Photographs & Photobooks will be held at Swann Auction Galleries (104 E 25th St #6, Kips Bay, Manhattan) February 9–14.